It has been a month since my last post, but I spaced this post out, because I don’t think a cut-by-cut analysis is necessary. You’ll see in a follow-up post that the film holder parts are coming along slowly, but they require so many set-ups it may seem I am not moving anywhere. As a result, for the sake of morale on the project, I decided to start building the actual camera itself in conjunction with the film holders. I figure, the quick progress I can make on it will help me feel like I am actually accomplishing things day-to-day. Also, by the time the holders are ready, I am hoping to be at a point where I can start making the camera back where they will be held. What I have been finding out, as I move along, is that the techniques for building each joint, is the part that is really causing me the most time. As I become used to making certain types of cuts, and joints, the process is speading up, and my confidence is going up, so I am able to move right into a part without spending a day planning it out like I was before. As a result of the increase in woodworking knowledge, and speed of production, I am able make changes as I go along. The decision making period is speading up too, which means my notes are becoming less detailed in some ways, but more precise in others. Instead of sketching something out several times, and deliberating dimensions, and scales, I am finding that I have a good idea of what size of part, and type of joint will work best, right off the bat. 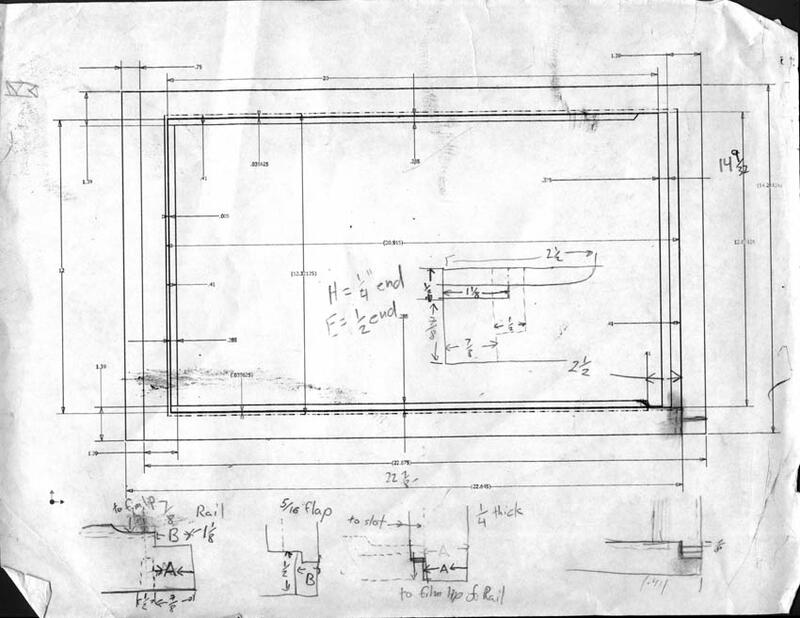 My sketches, now, are basically a scaled pencil drawing with a few key dimensions, and a parts list. I have foregone the super-detailed CAD drawing with every dimension plotted out. 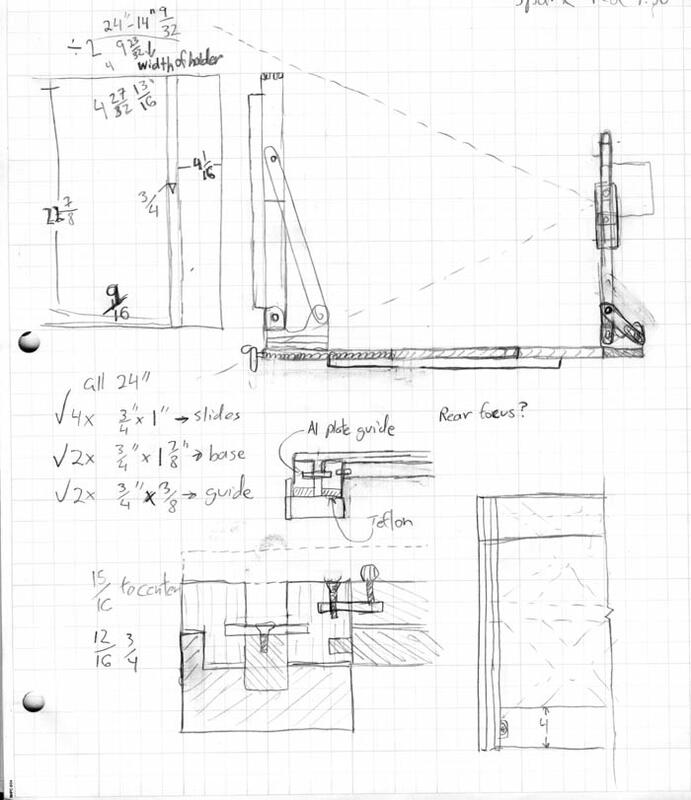 I have intuitively included how the machines cut, and the better wood joints into the design as opposed to trying to think up how everything will fit together. All this has been a direct result of the woodworking class I am taking with a great instructor, Shannon Wright, who has been showing simple and versatile methods of furniture building. Plus there is a really knowledgeable shop manager that has given me advice, and cues on how to use certain jigs and saws. The time working in the shop has really become something I look forward to. There is almost a genetic connection to the work. The cultural traditions of cutting wood into shapes that are useful is something that has been a joy to explore. Just getting into the simple things, like sharpening a chisel, can take me into thousands of years of history, and wisdom. So not only is the camera itself an exploration of past photographic methods, but the build process has been an almost zen experience, and lesson on the works our forefathers mastered to colonize the planet. Anyway, without further rambling, here is what my notes look like. This entry was posted on Thursday, March 20th, 2008 at 9:00 pm	and is filed under 12x20 Ultra Large Format. You can follow any responses to this entry through the RSS 2.0 feed. Both comments and pings are currently closed. I am also contemplating an ULF camera. I have built a 4×10 back for a zone VI camera. It is a little bulky and I am still chasing down a light leak. I also made a bunch of sketches, but a lot was built by the seat of my pants. 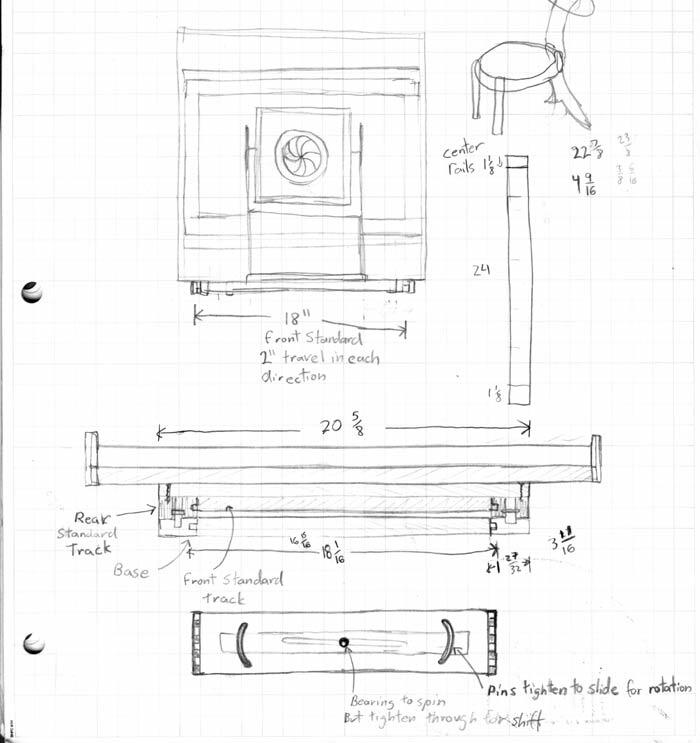 My biggest problem was making the bellows and not verifying the finished dimensions. It ended up the bellows was an inch larger than the back leaving me no way to attach it. I ended up making the back twice. I noticed that my method of shift and swing is pretty much the same as your sketch. The last problem I had was I couldn’t compress the camera enough for short lenses due to a couple protruding knobs. Sometimes longer isn’t better. Thanks for the note. The bellows are a big cloudy spot for me, because of that tight fit needed, but I found a book and a couple resources that seem to have a formula for coming up with good measurements. I’ll post when I get tot hat point. I hadn’t thought about the short focusing distance when I started, but as I looked around I noticed a great design point on the Lotus camera that allowed the back end of the front standard slide to slide past the rear standard. Basically if you drop the brace down so it doesn’t overlap, then the two slides can run past each other. As I make progress I am really starting to feel like the design will hold up. I fear that “Oh sh…” moment when something doesn’t fit or collides with another part, but the whole thing goes along so slowly, it has been giving me time to watch out for those sorts of things. So far so good. And as final note; do you have any pics up somewhere to take a look at? I love looking at home-builts, there aren’t many around to look at, so its neat to see what other builders are up to.